This release marks the second issue in a series of beautiful hologram coins. Mintage of the release is limited to only 8,500. 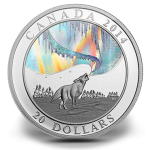 "Out there, standing in the dark, Earth’s great lightshow may take on a whole new dimension if the shimmering ribbons of light are accompanied by the sound of howling wolves," offers a statement on the Royal Canadian Mint's website. "It’s one of the most hauntingly beautiful experiences that the wilderness has to offer..."
That experience is presented on the reverse of this new coin with a lone wolf as it stands howling in the foreground. In the background, the awe-inspiring Northern Lights can be seen. The lights are presented in a hologram to enhance the detail and more accurately reflect their true appearance. The reverse was designed by Canadian artist Nathalie Bertin. Inscriptions on the design include CANADA, 2014 and 20 DOLLARS. Bertin's initials of NB can also be seen. Each coin is struck as legal tender of Canada and offers Susanna Blunt's effigy of Queen Elizabeth II on the obverse. Inscriptions surrounding the design include ELIZABETH II and D G REGINA. The coin is composed of one ounce of 99.99% pure silver. They have a diameter of 38 mm with a total weight of 31.39 grams. 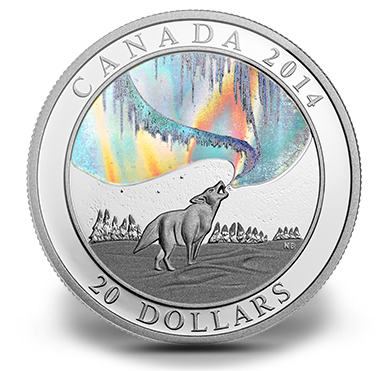 The Northern Lights: Howling Wolf Silver Coin may be purchased directly from the Royal Canadian Mint. Orders are accepted by calling 1-800-267-1871 (Canada), 1-800-268-6468 (US) or 613-954-2626 (International). Pricing is CAD $109.95.